Global sea ice extent is falling off the chart, as illustrated by the image below. The National Snow & Ice Data Center (NSIDC) is one of the world's best-know archives for satellite data on sea ice. In its recent news release, NSIDC notes that the difference between the 1981-2010 average global sea ice extent and the 2016 extent was over 4 million km² in mid-November 2016 (image on the right). The fall in sea ice extent constitutes a huge amount of energy that is no longer reflected back into space and is instead absorbed by the ocean, the atmosphere and by the process of melting itself. In line with earlier calculations by Professor Peter Wadhams, a 4 million km² sea ice decrease could equate to a radiative forcing of as much as 1.3 W/m². All this extra energy does not directly translate into a rise in temperature of the atmosphere, since a lot of energy has over the past few decades been absorbed by the ocean and has also gone into the process of melting itself. However, it now looks like the temperature of the atmosphere is catching up fast, as illustrated by the image below. On the right is a forecast by the European Centre for Medium-Range Weather Forecasts (ECMWF). 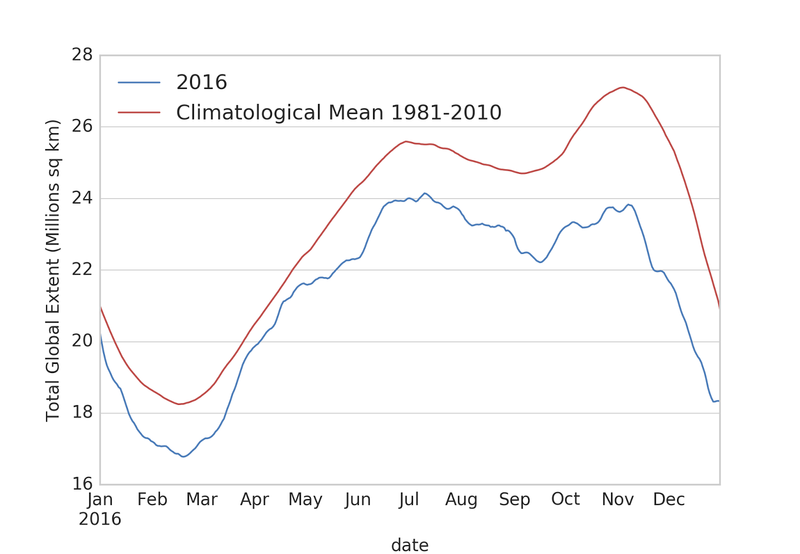 It shows that we've barely been in a La Niña, which typically makes the atmosphere cooler than it would otherwise have been. 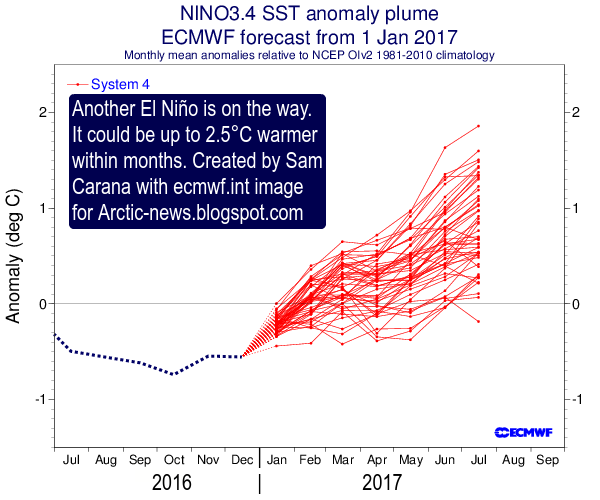 Already now, another El Niño is on the way that could soon make it up to 2.5°C warmer than it is was late last year. 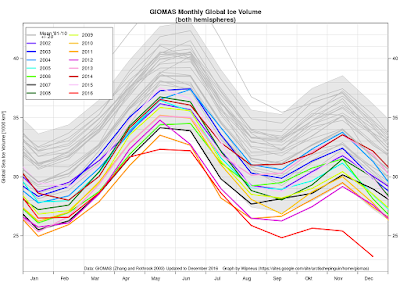 Global sea ice volume is also at record low, as illustrated by the image below on the right. 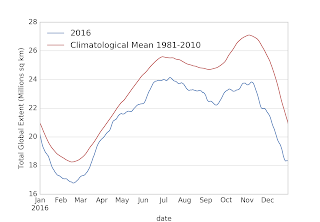 Arctic sea ice thickness hit a record low in November 2016 when thickness fell below 0.7 m or 2.3 ft.
As the ice gets thinner, the risk of collapse grows, as increasingly stronger winds and storms and stronger wave action can more easily break up thin sea ice, making it more vulnerable to melting and to get carried out of the Arctic Ocean by stronger cyclonic winds and stronger exit currents. Disappearance of Arctic sea ice increases the risk of huge methane releases from the seafloor of the Arctic Ocean. The outlook is terrifying. 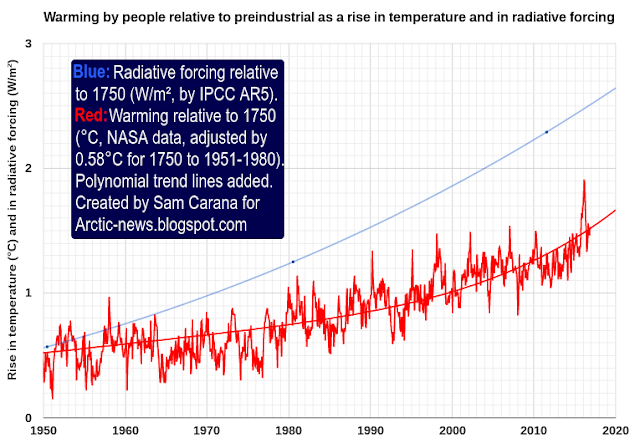 As I calculated last year, surface temperatures of the atmosphere could rise by some 10°C or 18°F within a decade, i.e. by 2026. January the 18th is the day that NASA will release the temperature rise for 2016 at according to Gavin Schmitt tweet that should be around 1.21. 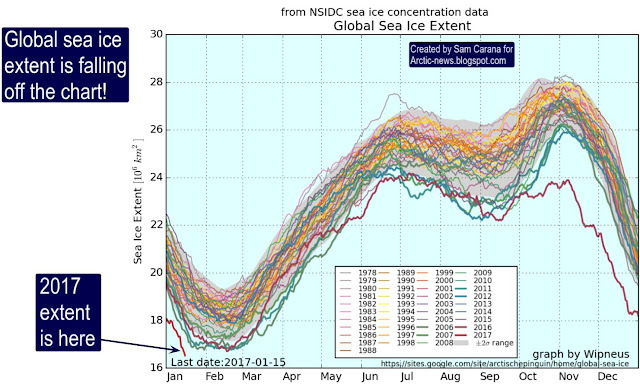 I think we're close to Arctic's Maximum Sea Ice this year. It will mean a Farewell to Ice, just like Professor Peter Wadhams said so. I'm translating this article to French for "Le Climatoblogue". hi Sam, it is alarming the way global sea ice extent and area have left the building last Oct. It is likely the Antarctic will lose a good chunk of the Larsson C ice shelf and possibly part of the Brunt ice shelf. 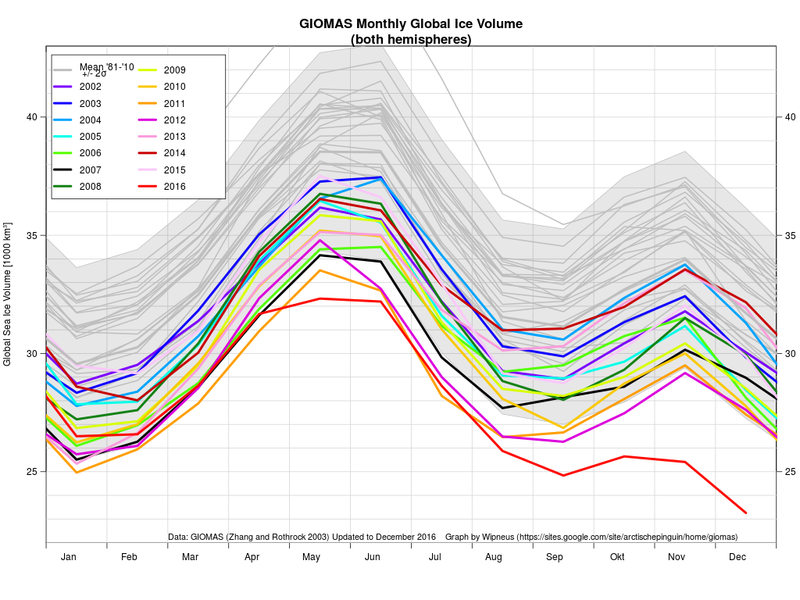 if both go this year, sure global sea ice area will diminish even further, but by how much more? And, is this a blip or the new standard?